We designed our online classroom to work across a variety of input devices: from laptop and mouse to tablet and touchscreen. Indeed, a recent analysis of our power users showed that most aren't using touchscreens. However, we've had a number of tutors without touchscreens ask how they can improve their drawing. Drawing/graphics tablets represent a quick win. They're relatively cheap but make drawing on an online whiteboard a lot easier. As ever, there's a somewhat overwhelming array to choose from, so we thought we'd review some of the best, affordable options. We selected 3 tablets for the test: Parblo Island, Wacom Intuous Draw and Huion H420. 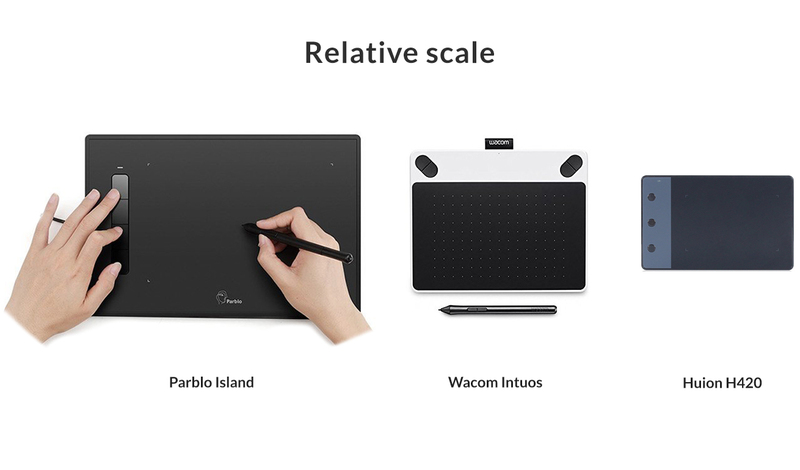 Wacom are the big name in the graphics tablet space, the Intuos Draw is their entry level offering and more than sufficient for online tutoring. The Huion H420 is the budget option, it works well but is a little small. The Parblo Island was recommended to us by Manning's Tutors, it's the same price as the Wacom but you get a much bigger drawing surface for your buck. We rated each tablet in 3 categories: drawing quality, installation/setup and value . The Parblo comes out top, it comfortably offers the best drawing experience. It's just a little trickier to setup than the Wacom, which remains a solid bet. If you're after the best drawing experience, the Parblo comes out top. It's got good sensitivity, it tracks the pen when it's held above the tablet (vital for easy drawing) and it's big. Size is the primary strength over the other contenders. The drawing area is almost twice that of the Wacom, which makes neat handwriting so much easier. The only downside comes in the installation and setup. Installation wasn't so bad, I had to head to the Parblo website to download a driver but once that was installed, and my Mac reset, we were up and running. Setup was fine, until I plugged in my second monitor. With the Wacom, I could choose for the tablet to just map to my second display. This wasn't possible with the Parblo: I either had to map to both displays, reducing the effective active area, or just use one display. Upon reflection, this may be a somewhat niche problem. If you just use a single screen, you should be fine. At just under Â£50, the Parblo offers the best improvement to your drawing abilities. If you're serious about tutoring online, it probably pays for itself in a handful of sessions. A solid contender. The Wacom is the easiest of the 3 tablets to install and setup, although it does still require the download of a driver from the Wacom website. Once installed, it's reliable and flexible. It probably has the best drawing sensitivity, although any differences versus the Parblo are barely perceptible. At Â£50 I still think it represents good value, given how much of a difference it can make. Size is the only issue. The active area is roughly that of an A6 piece of paper. That's reasonably small so sets a limit on your writing size and fidelity. Aside from that, the Wacom isn't a bad choice. The Huion offers superb value, coming in at less than half the price of the more than reasonable Parblo and Wacom. However, you do rather get what you pay for and in this instance that means a very small drawing tablet. To continue the paper size comparions, we're down at A7 now, which is pretty tiny. As such, writing much more than a couple of lines/equations per page becomes difficult. To that end, we'd recommend stretching to the Parblo or Wacom, if possible. If not, I guess you can always try the Huion and return it if it's no good.